The newest apostle is an appealing blend of gusto, creativity, business experience, and pioneer-style faith. Editor’s note: As final preparations were being made for the publication of this issue, Sister Perry passed away December 14, 1974. This was eight years before Elder L. Tom Perry was called by President Spencer W. Kimball and sustained by the membership of the Church as the 81st member of the Council of the Twelve Apostles in this dispensation. His family heritage and special experiences show that Elder Perry has been prepared by the Lord for his calling; he has diligently worked at polishing his character and his ability to be worthy of the callings that have come to him in the kingdom of God. “The front door opened and they heard someone coming through the house toward the kitchen where the family was assembled. When he entered they saw that it was an old man with a white flowing beard. Although it was a stormy night there were no signs of raindrops on his clothes. He said, ‘God bless you’ and asked for food and if he could spend the night with them. Although they were poor and had little bread they gave him food and shelter. When he came in he had a knapsack on his back with a little pup which he gave to the children to play with. During the evening he took from his pocket a book from which he read to them, telling them it was soon to come forth and telling them to get one at their first opportunity. As he was leaving them the next morning he promised them that they would never want for bread, which promise was literally fulfilled. That very day a man who owed them some money asked if they would take wheat for the debt. Gustavus Adolphus Perry and his family later joined an independent company of Saints and crossed the plains, arriving in the Salt Lake Valley in 1853. They settled in Three Mile Creek in what is now Box Elder County and did much to pioneer that area. The name was later changed from Three Mile Creek to Perry in honor of the Perry family. The Sonne line of Elder Perry’s ancestry was a deeply religious Danish family. Ole Nielsen Sonne, Elder Perry’s great-great-great-grandfather, was the parson of the Osterlarsker Church on the Island of Bornhölm, Denmark. Elder Perry’s grandfather, Niels Christian Sonne, was baptized in 1872 after coming to Utah, and he settled in Logan, Cache County. Elder Perry recalls his grandfather’s broad shoulders, symbolic of his physical stamina and his strength of character. Niels Christian Sonne and his wife, Lisa Christiansen Sonne, were the parents of Elder Perry’s mother, Nora, and were also the parents of Elder Alma Sonne, who has served since 1941 as an Assistant to the Council of the Twelve. He got the job and moved into the Beehive House with the Smith family. After graduating from the LDS High School, Elder Perry’s father enrolled at the University of Utah, where he became the 1910 senior class president and class valedictorian. After graduation, he taught school and farmed for several years, but decided to become a lawyer. After attending the University of Chicago and Stanford University, he moved to Rexburg, Idaho, where he became city attorney. He later moved to Logan, Utah, where he practiced law, served as a bishop for 18 years, as stake president or member of a stake presidency for 20 years, and died in April 1966 at the age of 81. Elsie Nora Sonne, Elder Perry’s mother, was born and grew up in Logan, Utah. Her brother and sister, Alma and Emma, who were twins four years older than she, remember her as being very competent and as having unlimited confidence in herself. They said she could undertake anything and succeed in it. Nora’s mother was ill most of her life, so from a very early age Nora learned the value of hard work. From the time they were small, Emma and Nora did all the household tasks in the Sonne home. Nora attended Brigham Young College in Logan and in 1910 graduated in domestic science from Utah State Agricultural College (now Utah State University). Nora Perry was a woman who supported her husband and reared her children in the ways of the Lord. Elder Perry recalls kneeling with her by his bedside while she first taught him to pray. Even when he was much older she would walk up the stairs with him and his brothers and would wait at the door long enough to be certain that her sons had remembered to say their prayers. The home Tom and Nora made for their seven children was a loving one where they made the gospel a principal part of their lives. Once each day, Nora would set the backs of the chairs toward the table so that family prayer could be held. Bishop Perry’s sons mowed the lawns around the chapel of the old Logan Ninth Ward from the time they were very young. Saturday afternoons, conditions permitting, the family went up Logan Canyon to fish, play horseshoes, or hike. Young Tom was committed to perfect attendance at Church. One Sunday he was so sick with tonsillitis that his parents decided the attendance record would have to be broken. All members of the family left for Church except Tom and his mother. The family was surprised to see them enter the chapel only a few minutes after the meeting had started. Despite the fact that he was quite ill he made every effort possible to be where he knew he was supposed to be. Tom had a paper route for a period of time. Sometimes during the winter months, delivering the papers became a very difficult task because of piercing cold and heavy snow. On one winter morning when a blizzard had dropped over 20 inches of snow the night before, Tom returned home almost an hour later than usual. He had been nearly on schedule until he came to the last house on his route, a house located about a half mile off the road. He trudged in the cold through the snow for almost an hour to deliver just one paper. Tom was the neighborhood leader among the boys. No umpires were needed for their ball games because he had an unusual ability to arbitrate disputes. As a result, the games were remarkably free from contention. As an Explorer Scout, Elder Perry played vanball, a modified form of volleyball. After placing second in the all-Church tournament two years in succession, 1938 and 1939, Tom, then a senior in high school and captain of the team, led them to a first-place finish in the tournament in 1940. He remembers his father, the bishop, excitedly leaping from the stands after the final point was made to hug him and lift him into the air with congratulations. The next year, 1941, the Logan Ninth Ward again won the tournament. Their assistant coach was an enthusiastic L. Tom Perry, Jr.
“I was assigned to serve in Columbus, Ohio, just after I had arrived in the mission field. I knew absolutely nothing about missionary work and my senior companion, who had been out only three months, knew little more than I did. I had always been strong in the Church, and though my testimony had never been tested, I surely thought that it could never waiver. “Well, my first full day of proselyting was spent going from house to house. We didn’t have much success until a kind Southern Baptist lady invited us into her home. She had a profound knowledge of the scriptures, and I’m afraid that my companion and I could not counter her persuasive arguments. I went home that day a converted Southern Baptist. “The following day was not much better. I went home a converted Methodist. And the next day I was swayed toward the Lutheran faith. I finally decided that this kind of thing should not be happening to a Mormon missionary. I decided that before I could teach and bear testimony about the gospel it was first necessary that I know something about it myself. “My companion and I lived on the top floor of a four-story rooming house. The landlady had granted us the privilege of using the kitchen, which was in the basement. I decided that each night I would go down to the kitchen after my companion had retired to bed and prepare a talk, beginning with the first four principles and ordinances of the gospel. “The first night I studied and prepared a talk on faith that I presented to my audience: a mouse that I had coaxed out of his hole with a cracker. He stared at me for a minute, picked up the cracker, and went back into his hole. “The following night the subject was repentance. The mouse came out and listened to me for some time longer than the night before, and then returned to his hole. I was making progress. “The third night I came down and filled the dishpan with water and washed some dishes before I prepared my talk on baptism. Again, my friend the mouse came out of his hole to hear my presentation. He stood there and stared at me the whole time, and when I was finally finished he walked back to his hole in deep thought. I was a bit proud of myself as I walked upstairs, knowing I had really impressed my audience. While in Cedar Rapids, Elders Perry and Wilkinson participated on the Cedar Rapids YMCA Volleyball Team with approval of the mission president. In 1943, this team went to the national finals. Elder Perry was selected as the outstanding player of that tournament. Six weeks after he returned home from his mission, Elder Perry was drafted into the armed services. He volunteered for duty in the Marine Corps and was with the first occupation troops to enter Japan. While on the island of Saipan, located in the Pacific, he and his companions built a small chapel. Later, in Nagasaki, he touched the hearts of a congregation of Japanese people when he led a group of servicemen in rebuilding a Protestant chapel. When they were transferred to Sasebo, over 100 members of that congregation lined up along the tracks and, as the train went by, touched hands with Elder Perry and his companions to show their gratitude. Following his release from the Marine Corps in the fall of 1946, Elder Perry returned to Logan and Utah State Agricultural College. The stake leaders called him to serve as secretary of the Cache Stake MIA. One of his responsibilities was to take attendance of those from the various wards at stake MIA meetings. On one such occasion, he saw a beautiful young lady, Virginia Lee, seated at the back of the congregation. By his own admission, he did not have his mind on the attendance records for the remainder of the evening. He met Virginia through a mutual friend following the meeting. Their courtship began with a date on New Year’s Eve, 1946, and they were married in the Logan Temple by President ElRay L. Christiansen on July 18, 1947. During their companionship over the last 27 years they were blessed with three children: Barbara, Lee, and Gay. On December 20, 1949, the Perrys became the proud parents of their first child: a daughter, Barbara. 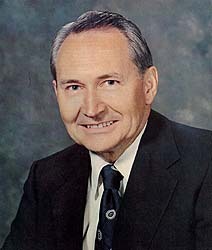 Elder Perry’s business career began in 1951 with the C. C. Anderson Company of Allied Stores, Inc., in Boise, Idaho, where he was the internal auditor. Their son, Lee, was born there April 29, 1951. Six months later, Elder Perry was transferred to Lewiston, Idaho, where he became controller of the C. C. Anderson store. In 1953, he was offered a position as controller with Broadway-Hale, Inc., and moved to Sacramento to assume responsibilities in that city. It was there that Gay was born on March 9, 1958. He remained with Broadway-Hale until 1962, when he and his family moved to New York, where he became controller of Associated Merchandising Corporation and vice president and secretary-treasurer of Aimcee Wholesale Corporation. In 1966, the Perry family moved to Boston, where Elder Perry assumed the position of vice president of finance for the Lechmere Sales Corporation. He became treasurer of R. H. Stearns, a department store chain in Boston, six months prior to his call as an Assistant to the Council of the Twelve. “When I was a young man in my late twenties I was offered the position of controller in a small store in central Idaho after only six months of experience in the retail business. I worked a month in this new position before my family could come and join me. During that month, I almost lived at the store. Working until the early hours of the morning was a common occurrence as I attempted to keep up with the work load that I had been assigned. I was having a desperate time trying to learn a new job and keep pace with the responsibilities I had been given. “Just after my family arrived, a car pulled up in front of our home one evening and I was invited to visit with a member of our stake presidency and a member of our ward bishopric. I was shocked: the bishop’s counselor was being called as the new bishop, and he had selected me as his second counselor. My first reaction was to say, ‘No. I am too busy,’ but the training of my parents soon rang louder than my first reaction, and I agreed to serve. Elder Perry’s business career has prepared him for his present assignments as chairman of the Church’s Personnel Committee, Budget Committee, Data Processing Committee, and Bicentennial Committee and as member of the Expenditures Committee and the Church Education Committee. Elder Perry’s Church service has been extensive, especially in the outlying areas of the Church. He served as second counselor in the bishopric in Lewiston, Idaho, for two and a half years. He recalls staying up many nights all night with this enthusiastic ward group, canning fruit as a stake welfare project. He was called to serve as a member of the stake high council in Sacramento on the same day in 1958 that his daughter, Gay, was born. During this time he also taught an early morning seminary class, and even today remembers an experience he had with a nonmember girl who participated in the class. Every morning she threatened not to come back the next day, but when the year ended she had a perfect attendance record and was baptized soon after. In 1961 Elder Perry was called as second counselor in the American River Stake (now Sacramento California East Stake) presidency, and served until he and his family moved east in June of 1962. In New York, Elder Perry first served as stake mission president and later as a member of the high council. In 1964 he and his wife served as World’s Fair missionaries at the Mormon Pavilion, where Elder Perry was known for his great ability to sell copies of the Book of Mormon. A week and a half after arriving in the Boston area in 1966, Elder Perry was called as first counselor in the Weston Ward bishopric. 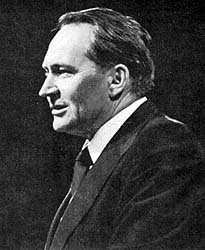 In 1968, he was called to be a member of the stake presidency and became the president of the Boston Stake (now Boston Massachusetts Stake) in January, 1970. During his leadership, the Boston Stake was authorized to pilot the Seminary Home Study Program, and was the first stake in the Church authorized to host what has become known as young adult conferences. President Perry was a man greatly loved and respected in the Boston Stake. He served the Lord and the members of the Church in that area diligently. He saw a great deal of talent among the people in the wards and branches of the Boston area, and through guiding this talent and allowing it to express itself, the Church blossomed under his leadership. President Perry was greatly loved by the members of the LDS Students’ Association in the New England Region. Just prior to his departure they gave him the King Benjamin Award for his “enthusiastic and understanding” service. “Elder Perry is an original thinker. This great gift, along with his wealth of experience, in business and in the Church, makes him particularly effective. “He is courageous and persevering. “His experience with modern business techniques makes him invaluable in helping the Church leaders provide the most modern business techniques to the administration of the work of the Lord. “As a financial executive in the retail business, Tom worked long, hard hours. At Christmas time, he literally worked day and night. In addition, he held positions of leadership in the Church and tried to do his part in the communities in which we lived. He made a real effort to make his limited time with the family count in quality. Nevertheless, the children may have felt a little cheated at times. “After living in California for several years, Tom received an employment offer from a firm in New York City. After asking for inspiration and direction from the Lord and discussing the pros and cons of this venture, we decided it would be right to accept this opportunity. Upon receiving confirmation from our Heavenly Father, we traveled across the country with our family to the east coast. We started looking for a home in New Jersey, and kept looking all the way through the state of New York and into Connecticut. Finally, in the beautiful state of Connecticut, we found our dream home on a little, secluded, winding country lane, tucked back in the woods. We all fell in love with it. Tom said, ‘Well, now the thing to do is to test the commuting time.’ So, early the next morning, he caught the New Haven train for New York City. “Even though the statement was made partly in jest, Tom got the message and took it seriously. We moved to Scarsdale, where the commuting time was 35 minutes. Tom made sure he had every Saturday off, and we tried to make this a family day. I think Tom realized the great importance of having a balance in life and not letting his professional work monopolize too much of his time. “Later, when he was stake president in Boston, he counseled the men of the priesthood to fill out a calendar each month, and the first item to be placed on that calendar should be a date with their wives each Friday evening﻿—then family home evening every Monday, then priesthood meeting, sacrament meeting, home teaching, etc. “However, the real test for Tom was yet to come. He was contacted by the president of a west coast company, who was most desirous of having Tom join their firm. We were reluctant to even consider leaving our beloved New England. So Tom made financial demands in salary and profit sharing that he felt certain this company would not meet. To his surprise, they agreed to his terms and suggested he go to San Francisco to make final arrangements. “Tom told the president of the company that past experience had taught him the importance of keeping a balance in his life. He must have time not only for his work, but adequate time for family, church service, and community activity as well. If board meeting was on Saturday, it would be necessary for him to have another day during the week to devote to his family. Understandably, he was told this would disrupt the entire store organization. When such a generous offer had been made, the company executive was shocked because Tom was so concerned about what to him was a small matter. My father is a man who believes in involving his family in his many-faceted activities. My mother has been his favorite typist and proofreader for years. In addition, she had read from the scriptures and Church magazines and other articles of interest into a tape recorder so that he could use his driving time profitably. My sisters and I have done everything from running a mimeograph machine to correcting his grammar and spelling in his talks. By involving everyone, my father has made his callings and assignments a family affair, and this has molded us into a closeknit family, willing to share and sacrifice for the pleasures derived from working together. My father is a man who gleans satisfaction from simple things. He loves to work in the yard, he often does his own carpentry work, and is an avid sports fan. Our family has the greatest unity when gathered around the television set to watch the Boston Celtics, Bruins, or Red Sox play! “I remember that when we first moved to New York I had a hard time in school. One night I was finally able to get all my homework done except for English. By that time it was bedtime, and I was hoping I could get it done quickly. I read the assignment, and my heart dropped to my feet: ‘Make an outline of the story The Legend of Sleepy Hollow.’ I had no idea how to make an outline. “My father came up to say goodnight and found me crying. He told me not to worry and said he would help me in the morning. “When I got up the next morning I found a sample outline on my desk. My father had left for work early, but he’d written a sample outline before he had left. I always had been taught to put things into my own words, so, using his model, I was able to finish my assignment. My sister, Gay, who is still in high school, remembers games and relay races of the Weston Ward daddy-daughter parties where father’s enthusiasm almost always made them winners. She anticipates daily the frantic race she has with him to get to the sports section after the newspaper is delivered. Their discussions of Red Sox performances have become a finely tuned science. She is thankful for those delicious pancake breakfasts that her father prepares for her at 6:15 A.M. before she runs off to school. When my father was a high councilor in the Sacramento area, I would accompany him on his speaking assignments as his timekeeper﻿—a position I felt was very important. He would give me his watch, and I would sit in the center of the congregation, a few rows from the front. We used the signs of the three monkeys﻿—see no evil, hear no evil, and speak no evil. If he wasn’t standing straight, I would cover my eyes. If he was speaking too loudly, I would cover my ears, and just before his time was up, I would cover my mouth. Elder Perry speaks at pulpit. Since those early days, I have heard my father speak many times. I have observed the increased power with which he speaks. I have felt the special spirit he brings with him every time he stands before a congregation. It has always impressed me that my father has never challenged a congregation to do anything that he does not do himself. This is a testimony to me of his profound integrity. It is so easy to teach and expound correct principles; but the logic behind living the commandments is inherently convincing. The real discipline, the true measure of a man’s character, comes when he can practice those principles at the same level at which he preaches them. From what I have observed, my father does exactly that. Through his years of service in many positions of responsibility, Elder Perry has continued to grow with an eye single to the glory of God. Through abundant enthusiasm he has inspired many others to serve and grow. He has maintained a childlike love for all, which has enabled him to be empathetic to those in need and joyous over the achievements of others. He has selflessly centered his purpose in the gospel, bringing his family, friends, and others whose lives he has touched closer to our Lord and Savior, Jesus Christ. Now he is an apostle, a special witness of Christ, and has an opportunity to do the same for members and nonmembers throughout the world. A childhood picture of Elder Perry. The Logan Ninth Ward vanball team of 1940. Elder Perry is seated in the center of the front row, holding the ball. Both Elder Perry and his missionary companion, Elder Wilkinson, were six feet four inches tall. Elder Perry with his family as a youngster. Top: Lowell Tom, Mignon, Theodore Sonne. Bottom: Zada, Leslie Thomas, Robert Leslie, Elsie Nora Sonne, Gay. Elder Perry as a Marine in 1944. Elder Perry is welcomed to his seat as a member of the Council of the Twelve. Elder Perry as a member of the Sacramento California East Stake Presidency in 1961. The Perry family. Top: daughter, Barbara holding her son, Terry, son-in-law, Terry Haws, daughter, Linda Gay. Elder and the late Sister Perry and son, Lee Thomas.